Diego Hernandez wasn’t thinking much about climate change until last summer, when he was traveling with his family along the Gulf Coast in his home state of Texas, where his ancestors—cowboys and politicians, he said—reach back to the 1600s. His mother suggested they take the “scenic route” for that summer drive, Diego said, his fingers making air-quotes because there was nothing “scenic” about it. All he saw were oil refineries. Diego is a clean-shaven, lifelong Christian wearing a cyan blue button-down and polished cowboy boots, and a sophomore at Wheaton College in Wheaton, Illinois, which has been called the Harvard of Christian schools. The entrance sign, framed by a glowing bed of zinnias in full bloom, pronounces the school’s motto: “For Christ and His Kingdom.” But while Diego has all the credentials of a true political conservative—president of Wheaton’s Young Americans for Freedom chapter, a cabinet member of the College Republicans—he also finds himself genuinely baffled by the right’s stance against acting on climate change. While many evangelicals are preoccupied with the long-term state of human souls and the protection of the unborn, Diego and the other students I met at Wheaton are also considering other eternal implications and a broader definition of pro-life. They are concerned about the lifespan of climate pollutants that will last in the atmosphere for thousands of years, and about the lives of the poor and weak who are being disproportionately harmed by the effects of those greenhouse gases. While Diego was just shy of eligible voting age in the 2016 presidential election, he’s old enough to vote now. He and other young evangelicals thought hard this year about the politicians on offer, the issues they stand for, and who deserved their votes. What’s an Evangelical to Do? Evangelical Protestants—one in four American adults—are a political powerhouse. They are the single largest religious group in the nation, and they are nearly twice as likely to be Republican as Democrat. And while Baby Boomers are currently the strongest political voting bloc, that’s only because the older you are, the more likely you are to vote. The current crop of younger people—from Gen X to Millennials to the newly minted adults I met at Wheaton—are poised to dominate the eligible-voter body politic. They would definitively tip the voting scales—should they become engaged. There are signs they might be doing just that. From the Parkland school shooting victims to Millennial political candidates, the youth of America are speaking up. And, significantly, they accept the scientific consensus on climate change at a much higher rate than their elders. This is true even of young evangelicals, as the existence of the Young Evangelicals for Climate Action (YECA) attests. YECA is a ministry of the Evangelical Environmental Network that aims to mobilize students, influence religious leaders and pressure lawmakers into passing legislation to address climate change. I met Diego at a climate change discussion event on campus that was organized by Chelsey Geisz, a Wheaton junior and a YECA climate leadership fellow. From Colorado Springs, Colorado, Chelsey, 20, always loved nature, she told me as we sat together in a gazebo in Adams Park, near campus. She’d taken a few classes on sustainability at Wheaton, and last year spent time working at Eighth Day Farm in Holland, Michigan, where Christian volunteers have turned the dirt once trapped below strip mall pavement into garden plots to grow vegetables for the hungry. These experiences meant she was primed when she heard about YECA. Though non-partisan, YECA is targeting conservatives, since that’s where the facts of climate change have failed to lead to action. According to the organization, they’ve engaged more than 10,000 young evangelicals so far. Along with Chelsey, there are another half-dozen fellows at other schools across the country, helping to build the grassroots movement. The fellowship includes a summer training session that covers the science of climate change, as well as the socio-cultural and religious aspects of the issue. As a YECA fellow, Chelsey organizes campus events such as the session I attended in September and she serves as Wheaton’s executive vice president of campus sustainability, a new position that YECA helped develop. It can be tough to be an evangelical who cares about climate change, Chelsey said, “because the environmental activists don’t trust you and the evangelicals hate you.” Or they could hate you; she was quick to point out that the evangelicals she knows personally are generally tolerant of her views. “I’m not encountering anyone at Wheaton, even among my most conservative friends, who disagree with climate change,” she told me. She’s having some trouble with her father, though, who’s troubled by her YECA work. He holds a Harvard law degree, works at a company that invests in resource-rich properties, and associates Chelsey’s transformation into a “climate activist” with a liberal agenda he finds suspect. “For a man who has such well-reasoned opinions, I just feel like there’s so much emotion for him that it’s not about the science at all,” she said. As for liberals themselves, Chelsey said, some of them do treat evangelicals like her with some suspicion. After all, aren’t evangelicals the ones who elected anti-environment Trump? “I think there’s some misunderstanding about what our faith compels us to do,” she said as the sun set behind her, creating a halo around the edges of her auburn hair. 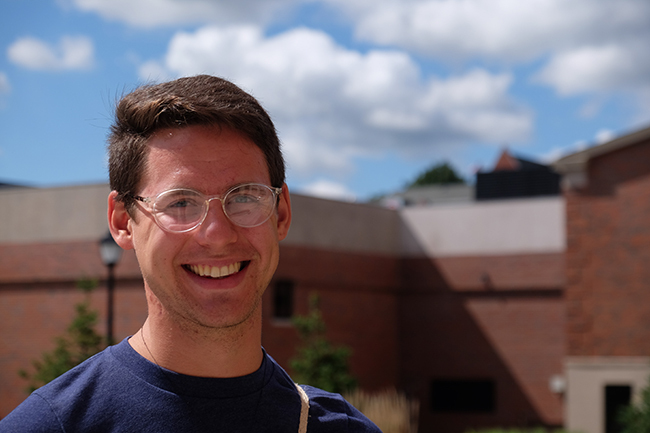 Sean Lyon is a recent Wheaton graduate who was also a YECA fellow while he was in school. He feels that he was born to love the natural world; his first word as an infant was “bird,” after all, and flying creatures remain a passion he can’t quite explain. While in school, he created his own interdisciplinary major of biology and business and spent significant time in Tanzania working with ECHO East Africa, a faith-based sustainable agriculture organization. He still lives in the town of Wheaton, easy commuting distance to Chicago, where he’s volunteering at the Field Museum of Natural History. Sean, 23, grew up in upstate New York, among “classic North American white evangelicals,” where climate was not a concern and politics were conservative. But his love of the natural world shifted his perspective. He saw heaven on earth, and something worth saving, in every wingbeat he witnessed. But God didn’t just create singular works, Sean said; he created systems, natural systems that every living being relies on. He hoped that all Christians—no, he corrected himself, all faiths—would unite to protect those systems. Climate science isn’t questioned at Wheaton College the way it often is in the wider evangelical community. The school is a brick-and-mortar rebuttal to the myth that science and religion must be at odds with each other. When Wheaton students step into their-state-of-the-art science building, for instance, they are greeted with signs stating that a “sound Biblical theology gives us a proper basis for scientific inquiry,” and a display featuring locally excavated Perry the Mastodon, which carbon dating shows to be more than 13,000 years old. The school is not alone in intertwining commitments to love God and protect the earth, often referred to as “creation care.” The Cape Town Commitment, a global agreement between evangelical leaders from nearly 200 countries, includes acknowledgement of climate change and how it will hurt the world’s poor (and it is required reading for Wheaton freshmen). Katharine Hayhoe, an atmospheric scientist at Texas Tech University and an evangelical, has been an outspoken advocate for climate action. And in addition to YECA, there are numerous groups active in this arena, including the Evangelical Climate Initiative, Climate Caretakers, Care of Creation and A Rocha. In late 2015, the National Association of Evangelicals (NAE)—the biggest umbrella group of evangelicals in the country, representing 43 million Americans—issued a statement accepting climate change, acknowledging the human contribution to it and encouraging action. YECA’s advocacy helped bring that statement, called “Loving the Least of These,” into being. In it, NAE argues that Christians should be compelled to care about climate change as a matter of social justice, equating those without the resources to adapt to failed farming or dry wells or rising seas as the modern-day equivalents of the widows and orphans of Jesus’s day. When Chelsey reads the Bible, she hears this gospel of social justice, too. Chelsey’s framing reveals that she is steeped in a liberal arts ethos friendly to intersectionality, the idea that humanity’s ills, which disproportionately affect the most vulnerable, cannot be conquered until root causes are addressed. This perspective is shaping academic dialogue in both secular and faith-based schools. But does fighting climate change detract from evangelism? Here there’s a rift within the evangelical community. Should the emphasis be on saving souls or saving God’s creation? And are the two really at odds? For Sean, there’s not one speck of conflict between his love of God and the gospel and his fierce desire to see action on climate change. They’re complementary, he said. Could his concern for the climate be a threat to his faith? I asked him. Abortion was the entry point into American politics for many evangelicals, after the Supreme Court affirmed abortion rights in Roe v. Wade in 1973. Before that, evangelicals were generally unconcerned about abortion rights, which had the uncontroversial support of Republicans; they were also generally disengaged from voting. Today, the single-issue anti-abortion preoccupation of many evangelicals, now considered a given by many political leaders, confounds some of the young evangelicals I met at Wheaton. Diego sees it a little differently. “Abortion is definitely a deal-breaker for me,” he said, even though he said he’s not generally a one-issue voter. He echoed Sean and Chelsey to some degree, agreeing that “being pro-life doesn’t just mean being pro-life to the baby at birth. It also means the life of the mother and the life of the baby after birth.” But when he watched the 2016 presidential debates, he found himself agreeing with some of Hillary Clinton’s points … until he was appalled by what he saw as her “gung-ho” support of abortion rights. He decided he could just not get behind someone with those views. Young evangelicals wrestle with these difficult choices in the voting booth, confronted with either/or candidates, unsure who will best represent their hopes for life on earth, all life, all of God’s creation. Right now, anti-abortion rights Christians typically have only one party to get behind. And it’s that party, represented in the White House, that is aggressively rolling back climate protections, from pulling out of the Paris climate accord to promoting coal. Future Powerhouse at the Polls? Diego, Chelsey and Sean are the future. This younger generation has grown up with the realities of climate change and political polarization since they were swinging on monkey bars, and they aren’t hesitating to break rank with evangelical Baby Boomers on the issue. They remain faithful and politically conservative for the most part, but they are more concerned about a climate that they will have to live with much longer than those boomers heading into retirement. The shift aligns with a recent Pew poll that found that among Republicans, young adults were far less likely than their elders to support reliance on fossil fuels. “Every one of the people who I’ve talked to who’s come to my events and engaged in climate issues from a Christian perspective said, ‘My parents don’t agree with me,’” Sean told me. But even with this clear shift toward accepting climate science among young Americans, the quandary for young evangelicals in the voting booth remains. Sean, who said he couldn’t in good conscience vote for either party, opted for Jill Stein in 2016. Chelsey, as a busy freshman in 2016, followed in her father’s footsteps and voted for Trump. Her father had been singularly focused on getting a Republican on the Supreme Court. Now, she hangs her head about the decision. Surveys show that the way people view climate change is determined more by political affiliation, along with race and ethnicity, than by religious affiliation. So while 81 percent of white evangelicals voted for Donald Trump, it’s important to remember that about a quarter of the country’s evangelicals are not white, and it is among minority groups that the evangelical community is growing. And on the issue of climate change, Diego’s Latino background makes him part of the American demographic that is most concerned about climate change. He wonders whether his mother deliberately pushed for that “scenic route” to wake him up a little. What are the choices for these faithful young? With church membership in decline and the Republican party in flux, how vocal these young people are could shape the future of the climate debate. If the Christian right wants to hold onto the next generation, getting right with the planet might prove as important as getting right with God. These new sermons and stories are unlikely to come from older pastors and preachers, most of whom have become representatives of the Republican Party platform that doesn’t want to even acknowledge that climate change is an issue to discuss, let alone embark on the massive undertaking necessary to begin to solve it. But for the young, who will live with the catastrophic predictions that worsen with each new iteration of the UN climate report, there are new stories emerging. They are conversion stories of a new sort, springing from dirt once buried under Midwestern parking lots and held aloft on the wings of Sean’s beloved birds. Preachers and politicians seeking to keep the young religious right in their midst may need to leap past the quagmire of a questionable climate change debate and get right to the root of finding solutions for the generations that will be living into the long tomorrow of a warming planet. This story was originally published on Inside Climate News. Meera Subramanian is an award-winning freelance journalist whose work has been published around the world, and her first book is A River Runs Again: India’s Natural World in Crisis from the Barren Cliffs of Rajasthan to the Farmlands of Karnataka.